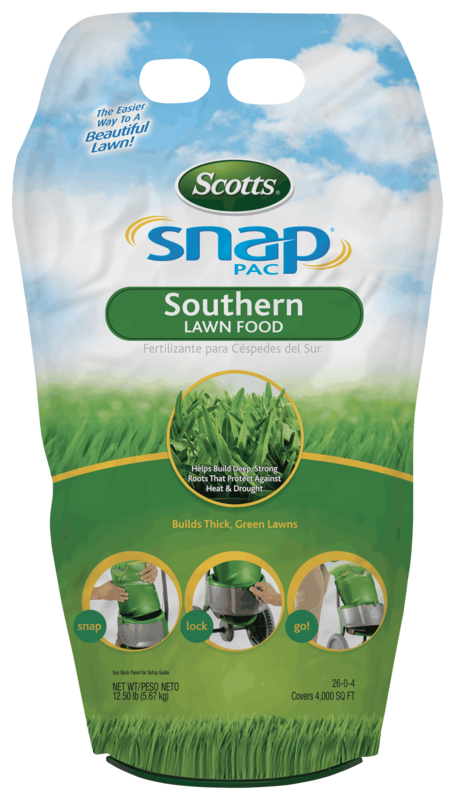 Build a stronger and fuller lawn (vs unfed) with Scotts® Snap Pac® Southern Lawn Food! This effective formula builds deeper grass roots while feeding and strengthening your lawn to help protect against future problems. The Snap® lawn care system contains Scotts® premium quality products for great results, and it only takes 10 minutes to use! Try the Scotts® Snap Pac® Southern Lawn Food to improve your lawn's ability to absorb water and nutrients, and enjoy a better lawn next spring. Apply to any grass type. Can be applied to a wet or dry lawn. Do not apply near water, storm drains, or draining ditches. Allow 6 to 8 weeks between applications.